This machine is awesome! It really works! Powerful washer! Thank you! Great person to do business with. Very fast delivery. I love it it looks exactly like the description. It is light-weight and easy to use. It does a good job of removing dirt from clothes as evidenced by the color of the wash water. I has no filter, of course, so things like lint and pet hair remain on the clothing, sometimes balling up, but this is to be expected for a machine without a filter. I can fit 6-7 of my husband's (Large) t-shirts or 3 pair of long jeans (4 pair of denim shorts) and still get a good result. Any more than that and I have issues with unbalancing. The spin tub, of course, holds about half of what the wash/rinse tub holds. But getting into a rhythm of moving the clothing back and forth helps keep from wasting time waiting. We live in an RV and use this outside on a picnic table. We fill from buckets rather than the hose, and drain into buckets (which we empty at the dump station in the campground) also. The system works very well for us! 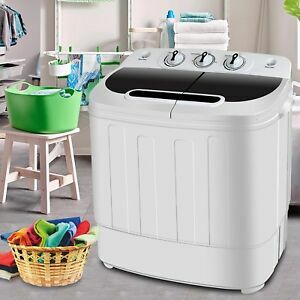 The spin cycle does an extremely good job of removing water, and the clothing dries on the line quickly as a result. (I have found that if I smooth out the wrinkles with my hands before hanging they look much better when dry.) For something at this price point and of this size, it does an amazing job with my laundry. Like many other reviewers on this model, I was pleasantly surprised at the power of this machine. It really does work very well. I've washed over 40 loads without a problem. A couple points that I've discovered, as well as picked up from others: DO NOT use more than a tablespoon of detergent. It's just not needed. Make sure the machine is either placed in the tub (while being aware of the low position of the electrical components) or place it high enough for it to drain into a sink etc. The spin dryer is amazing, and like the washer, just don't stuff it too tight. I've found that it's best to drain the washer and then place the wet clothing into the spinner and add water as it spins to rinse your clothing. Clothes are cleaner than when using the commercial washers available. We added a retractable clothes line in the hallway by our bathroom and use it to hang the finished clothing on. It dries pretty quickly. Overall, this little machine has been a great addition to our apartment. We save money, as well as not having to go down 6 flights of stairs to do our laundry. And, we can wash in our PJs. hahaha. Great deal! Money and time saver! Tips! The product is compact and very light. That being said, machine is POWERFUL! Easy to use and space saver. A must have if you live in an apartment and RVs. No more trip to laundromat every week. I live in a 2nd floor apartment and I have been so tired of carrying bags of clothes up and down the stairs. This will also be a big money saver for me beacause washers in thislaundromat cost less than $5 a load and dryers are 35cents/7mins. Where I live water is free, I can do as much laundry I want. I can also do other chores in between washes. Thumbs up for a 2 day delivery. Package was delivered with no damage at all. Tips: *To elevate the washer use the styrofoam that was in the box and tape it together (back to back). *Place your machine in the bathtub and use or buy a shower head with hose to fill it with water. *Fill up water up to H level and put enough clothes (make sure there is room for clothes to spin). *A tablespoon of detergent is enough. *Drain, fill water, add softener and do a 2nd wash to rinse off excess detergent. *Depending on the size, load your spin dryer evenly with only half of your washed clothes. *Use your washer at the same time with your spin dryer. (wait 15-30secs after turning on the spin dry before turning your knob back to standard for your washer). Note: Spin dryer might shake for the first 2-3secs if clothes are not evenly placed in the tub. It's super lightweight and pretty quiet unless the spin dryer is loaded unevenly. I just got it today and I've been using it for a few hours. It seems to get my clothes pretty clean and the spinner wrings them out pretty well, well enough they dry in about twenty minutes in front on a fan. Holds more clothes than what I thought. The hose doesn't quite fit my faucet but I just put it in my bathtub and use my shower head to fill it and also drain it in the tub because the drain hose isn't that long. The tubes and cords do have a slot in the back to store them so they aren't hanging though. Seems pretty good if you live in an apartment without a hook up and are tired of paying an arm and a leg for a laundry mat. I've read a bunch of reviews about them breaking down after a few months, I bought a 3 yr protection plan on it though, it seemed to be worth the extra $13 just in case. I also read reviews about people getting used, dirty ones but mine was perfectly clean and had plastic on it and didn't seem to be used at all. Seems worth the money so far (but again, this is only day 1 of owning it) Update... It's been 2 weeks and the spin dryer part is already broken and making a weird noise. Awesome machine if you only plan on using it a couple of times or a couple times a year I guess. Excelent. I really like it! I like it, the only thing I will change is the water inlet, it needs to be long and also the one that it used to drain the water. I use my own so it doesn't bother me. I really, really like it. It dries good, it cleans great. Very happy. A also I out it inside the bathtub and used my shower hose. Easy, easy.